Take the former “Riot Hyatt” on Sunset, throw in a $48M renovation by the New York firm Janson Goldstein, add the Hindi word for “personal service,” and what do you get? Why, the Andaz West Hollywood, of course. The bar at RH, the hotel’s signature restaurant, had been on my “to-do” list since its January opening, and I gladly accepted an invitation to sample the new summer cocktails. 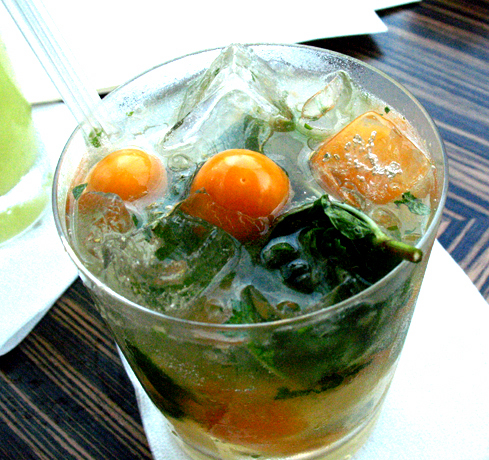 The bar is strikingly designed, situated in a prime location where the floor-to-ceiling windows facing Sunset Blvd. are put to optimal use. My friend Lena and I were introduced to Beau du Bois, who (along with Kassy Dean, Helena Pechacek and Neala Steaury) created the cocktails we were about to sample. As with other mixologists in high end restaurants, Beau works closely with RH chef Sebastien Archambault to get the freshest seasonal ingredients. Beau’s in-depth explanation of the creative process behind his drink menu reflects a thoughtfulness and ambition that will take him far in the cocktail world. Before tasting the new drinks, we started off with two of RH’s top sellers, the Mr. Plant and the Steelo. They call me Mr. Plant. Named of course after Robert Plant (who famously shouted “I am a Golden God!” from one of the Hyatt’s balconies), the Mr. Plant starts with No. 209, which has gin’s typical juniper aroma enhanced by citrus, fruit, and spicy notes. When the No. 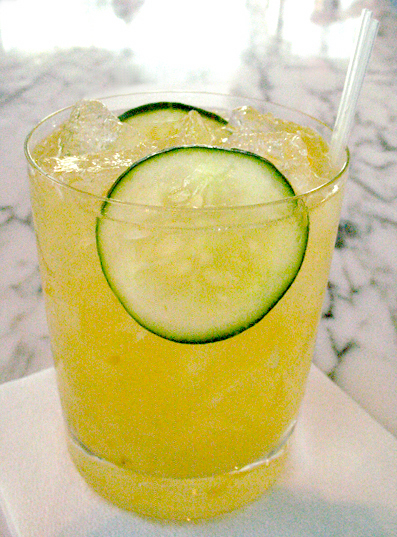 209 is mixed with the cucumber, tangerine and agave, the result is an outstanding, refreshing cocktail that goes down easily. Not to be outdone is the Steelo, another top seller that combines the smoothness of the Hangar One with the wonderful floral scent of the ubiquitous St. Germain. Served up, the Steelo tastes as great as it looks. If I had to pick just one, I’d give a slight edge to the Mr. Plant over the Steelo. That being said, both drinks are fantastic and it’s easy to see why they’re bestsellers. On to the season’s new cocktails, which made their debut last week. 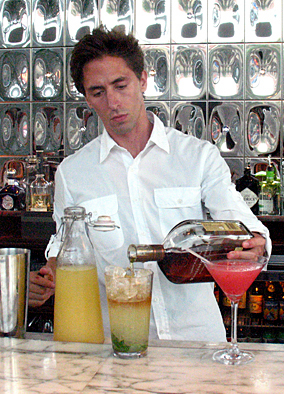 Unless otherwise noted, all cocktails were created by Beau du Bois. This was the first of the new cocktails that we sampled, and it’s a knockout. The TRU vodka has a clean, fresh taste that’s ready-made to play with the other ingredients. 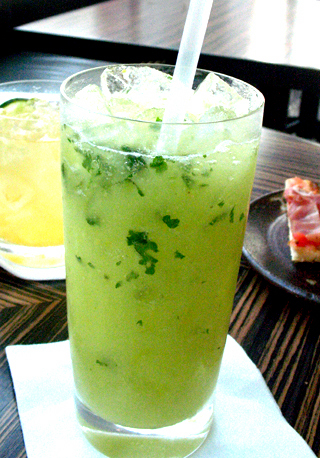 The cucumber provides a refreshing, subtle taste; the green apple juice (Beau took months to source it) gives it a sweet and tart kick; the cilantro a subtle bite and citrus finish. The avocado adds an unexpected texture that’s hard to place. Just as egg whites froth up a Ramos Gin Fizz, the avocado provides depth and body that takes the Greenland to the next level. G’Vine Gin is distilled from the Ugni Blanc grape, in the Cognac region of France. It’s then infused with nine botanicals, giving the G’Vine a floral complexity that enhances the Assemblage’s unique flavor profile. Add in the bitter orange of the Cointreau, the fruit flavors, a bit of sweet and a light tartness, and you have another summertime winner. Rush hour on Sunset: the 405 Crush. 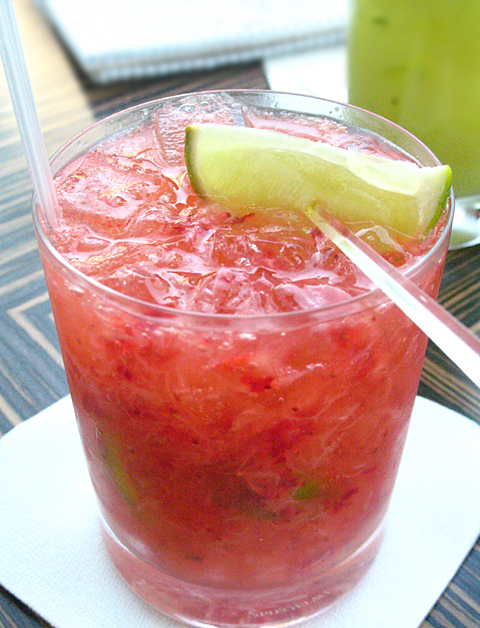 Leblon is an award-winning, ultra-premium cachaça distilled from sugar cane and aged in Cognac casks. 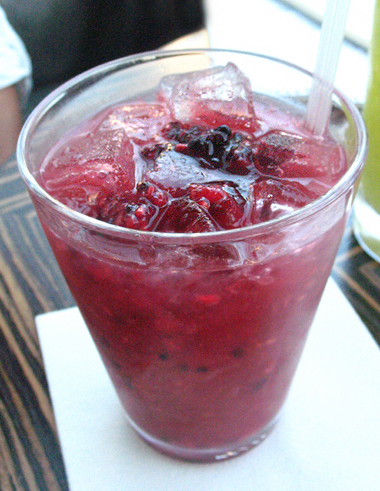 The distilling process has given the Leblon a dominant fruit profile, and when mixed with the fruit and agave, results in a nice take on the classic Caipirinha. A bit of a split vote with this one; while I enjoyed it, Lena needled me for liking such a “girly drink.” Fruity, sweet cocktails aren’t for everyone, but I could drink these all day long, especially if I’m poolside. Few cocktails can rival the mojito when it comes to hot weather refreshment, and Beau’s sublime, sophisticated interpretation is outstanding. It all starts with the Matusalem Gran Reserva, a blended rum that’s been solera-aged for 15 years. Its vanilla, molasses, and caramel aromas are complemented by the lime and mint, while the gooseberries add tartness and acid. For flavor and visual appeal it’s hard to beat. Of the new menu, the Greenland and the Gooseberry Mojito were the consensus favorites, and both drinks are sure to appeal to imbibers well into the dog days of summer. Time prevented us from trying two other new drinks, the Carnival (Papagayo Organic White Rum, white peach juice, raspberries) and Helena’s Ginger Mariachi (Corzo Silver Tequila, Domaine de Canton Ginger Liqueur, jalapeno, cucumber, tomato juice, lime juice, salt & pepper). Needless say, we’ll be back to try these out. 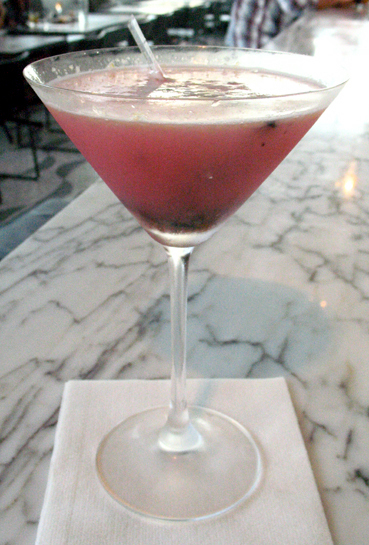 RH hosts a happy hour in its bar area from 5pm to 7pm on Monday through Friday. 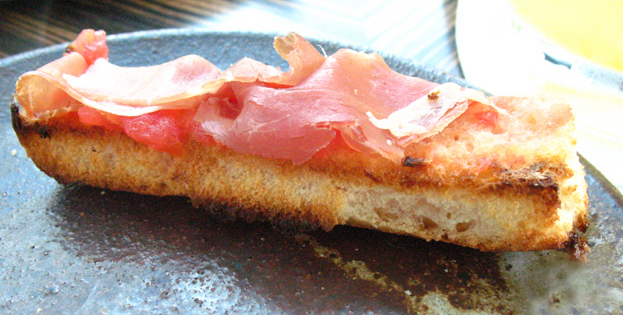 Although the cocktails are full price, a real bargain can be found in the delicious, free bar menu bites: shrimp ceviche, serrano ham with crostini, mushroom and egg tart, and soudourgh with olive tapenade. We’re way beyond chips and salsa here, folks. 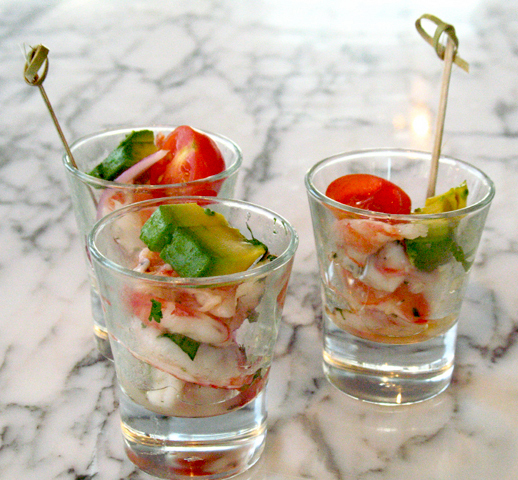 If the number of empty shot glasses were any indication, the shrimp ceviche was the favorite snack, matched perfectly to the summer cocktails.